LEAPING ONTO THE SAN DIEGO CIVIC THEATRE STAGE! THE NUTCRACKER WITH A LIVE ORCHESTRA DECEMBER 9-23, 2017. 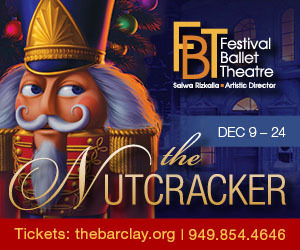 California Ballet's glittering production of The Nutcracker leaps onto the stage of the San Diego Civic Theatre in America's favorite holiday tradition. Under the baton of Music Director John Stubbs, Tchaikovsky's extravagant score comes to life with a cast of over 150.